At 7 pm on Tuesday 4 December, we responded to a call from a local villager who had stumbled upon, what she described as, a small, baby dolphin on the beach between Crovie and Gardenstown in Banffshire. Most often, baby dolphins turn out to be adult harbour porpoises, but on this occasion we arrived at the scene to discover a young white-beaked dolphin.Whilst sighted quite frequently off of Stonehaven and Aberdeen (SE of the Moray Firth), the species is considered a rare visitor to this area of the Moray Firth, certainly during the summer months at least. Sadly the juvenile female, measuring just 1.78 m in length, had passed away by the time we got to her, and we could do little more than recover her body from the beach. Bob Reid from the Scottish Agricultural College (SAC) collected the dolphin the following morning for autopsy. Later that day he reported the dolphin was found in good physical condition and there was very little to see grossly. Some damage had been inflicted on the left side of the head, but the puncture wounds on the lower jaw - intially considered to be teeth marks caused by interspecific aggression from a bottlenose dolphin - were concluded to be claw marks left by a large bird as it perched on the rostrum whilst pecking at the head. The fact that no bruising or haemorrhaging was associated with these marks indicated that they were indeed caused post mortem. However, the lungs of the young dolphin were over-inflated and had some fluid present suggesting that the animal most probably live stranded. Very sad. This will be confirmed when further histopathological tests are complete. 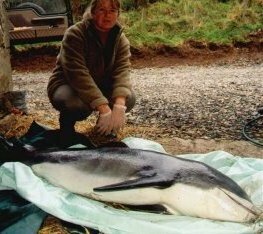 The records held by the SAC for white-beaked dolphin strandings in the Moray Firth area since January 1992 list 9 other incidents. The only record of the species stranding along the southern coastline of the Moray Firth during this 10 year period occured in Fraserbugh in April 1995. The present stranding therefore represents a very rare find indeed and could indicate that the white-beaked dolphin is in fact more prevalent in these waters - perhaps in winter months - than previously thought.